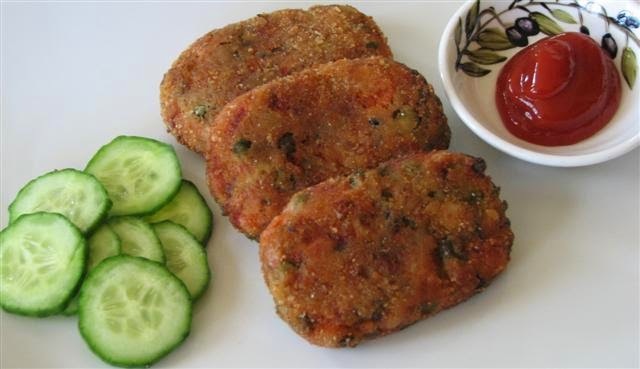 Vegetable cutlet is a very popular and simple snack item. It is very easy to make and can be had as an appetizer or light afternoon snack or evening snack with tea. It is great for small parties and get togethers. Today we will learn how to make Vegetable cutlet following this easy recipe. Heat a small amount of oil in a pan and saute curry leaves, green chillies, ginger, and onion. When they turn golden brown add crushed aniseed, chilly powder, cinnamon powder, cloves powder, turmeric powder and saute for 3 minutes. Then add beetroot, carrot and salt and cook for 5 minutes and finally add potatoes and coriander leaves and mix well. When the mixture is cool make an oval or round shape and keep it aside. Heat enough oil for cutlets to simmer and dip each cutlet in the egg and in the breadcrumbs and into the oil. When both sides are golden brown remove from the oil.